This vegan caramel slice recipe is hands down one of my favorite vegan desserts that I’ve tried! It pretty much has it all. The bottom shortbread layer is flaky and buttery and adds a nice crunch. The flaxseeds also give a nice toasty flavor and some added texture. The middle caramel layer is creamy, gooey, and sweetened naturally using just dates. Dates are actually super versatile for vegan desserts and I use them in just about everything, including my bliss ball recipes! I use Medjool dates because they have a richer, more caramel-like flavor compared to normal dates. Steeping the dates in warm water also helps to bring out that caramely goodness. Oh and let’s not forget about the top layer of these caramel slices…that’s where the magic happens…the chocolate layer. But it’s not just any chocolate, it’s a decadent vegan chocolate made with raw cacao! Three delicious layers of chocolaty, caramely, crunchy goodness. What’s not to love? Are vegan caramel slices healthy? I try to stick to healthy recipes with lots of colorful, fresh fruits and veggies here at Living Fresh Daily. But everyone has to treat themselves occasionally right? Desserts get a bad rep because they are traditionally pretty fattening and unhealthy, but they don’t actually have to be that way. 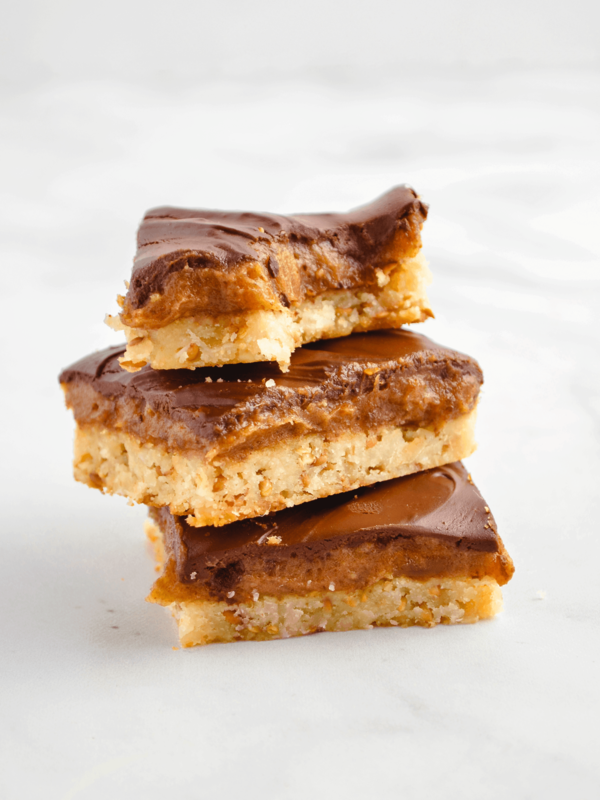 I try to keep my dessert recipes as healthy as possible without losing that delicious sweet flavor that we all crave, and this caramel slice recipe is no exception! I make my desserts healthier by sweetening them with natural sources like dates, syrup, or agave nectar, and using no added sugar. I also try to incorporate “superfoods” into my desserts wherever possible, like the flaxseeds in the bottom layer or the raw cacao in the top layer. While a good dessert will probably never be as healthy as a superfood smoothie, they can still be a lot less fattening and detrimental to our health than most people realize – especially as an occasional treat. Preheat oven to 350 F. Pit the dates, then steep them in warm water for 10 minutes. While the oven preheats, add melted vegan butter, almond flour, flaxseeds, and shredded coconut to a food processor. Mix together until you reach a “doughy” consistency. Line a 7″ x 7″ square baking pan with parchment paper and spread the shortbread mixture into the pan evenly. Once oven is preheated, bake the shortbread for 15-17 minutes or until golden brown and slightly crispy on top. While the shortbread layer bakes, drain the steeped dates. To make the date caramel, add dates, almond butter, 3 tbsp almond milk, 2 tbsp coconut oil, 1/2 tsp vanilla extract, and salt to a food processor. Mix until well combined and you reach a “paste” consistency. Once the shortbread base has finished baking, spread the date caramel over the top in an even layer. To make the chocolate layer, melt 2 tbsp coconut oil over low heat in a small saucepan. Stir in 1/4 cup almond milk and the agave until combined. Whisk in the raw cacao until well combined and smooth. Remove pan from heat and stir in 1/2 tsp vanilla extract. While chocolate is still hot, pour the chocolate over the caramel layer and spread it evenly. Put the vegan caramel slice in the freezer for at least 30 minutes to let it set and harden. Once hardened, remove from freezer, cut into slices, and enjoy! I made this recipe almost entirely out of ingredients from my last Thrive Market order. Thrive Market is an organic online grocery store that regularly saves me about 30% off my grocery bill! I get all of my dry goods and non-perishables there. Get an extra 25% off your first order here! I absolutely love layered dessert bars, and the chocolate-caramel flavor combo is a classic. The success of these vegan caramel slices has me super excited to try out other dessert bar flavors soon, so stay tuned for more recipes like this one! Blueberry crumb, cookies and cream, raspberry cheesecake, the dessert bar possibilities really are endless. Let me know if there’s a specific flavor you want to see me make! Did you try this recipe? Let me know what you think in the comments below and be sure to leave a rating! Trying these tomorrow can’t wait! These are amazing! I tried them out yesterday, so easy to make, lots of healthy ingredients and sooooo yummy! Thanks for the recipe! Thanks Jessica, I’m so glad you enjoyed them! Definitely one of my favorite vegan desserts! Whoops thanks for catching that Barb! It’s supposed to be 2 tbsp of agave nectar for the chocolate layer.